Welcome to the Olympic National Park Information Page. Olympic National Park is located in northwestern Washington in the north central part of the Olympic Peninsula. The Park occupies the central portion of the Olympic Peninsula, as well as a narrow 63 mile strip of land along the peninsula’s Pacific Coast. The Olympic Peninsula itself comprises the northwestern most tip of the lower 48 United States, lying west of the Seattle / Tacoma area and Puget Sound. The closest major airport is Seattle, Washington and there is a smaller airport in Port Angeles, Washington. 1. Take Highway 101 to the park. This highway takes you completely around the park. All park destinations can be reached for U.S. Highway 101, which circumnavigates the Olympic Peninsula. From the Seattle/Tacoma area, travelers may reach U.S. 101 by several different routes, either by crossing the Sound on one of the Washington State Ferries or by driving south around Puget Sound. Travel time along any of these routes is approximately two-and-a-half to three hours from the Seattle / Tacoma area to Port Angeles, where the main park visitor center and park headquarters are located. Bus Lines – Port Angeles is served daily from downtown Seattle and Seattle / Tacoma Airport by Olympic Bus Lines and Tours. Reservations are recommended. The Clallam Transit System provides service within Port Angeles and commuter services to locations around the northern Olympic Peninsula. Airlines – Horizon Air (an Alaska Airlines affiliate) provides regularly scheduled flights to Fairchild International Airport in Port Angeles from Seattle / Tacoma Airport and from Victoria, British Columbia. Olympic National Park has a diverse and stunning world, a fog shrouded coast with booming surf and waves-manicured beaches, spectacular alpine country dotted with sparkling lakes, lush meadows, glaciers, and North America’s finest temperate rain forest. 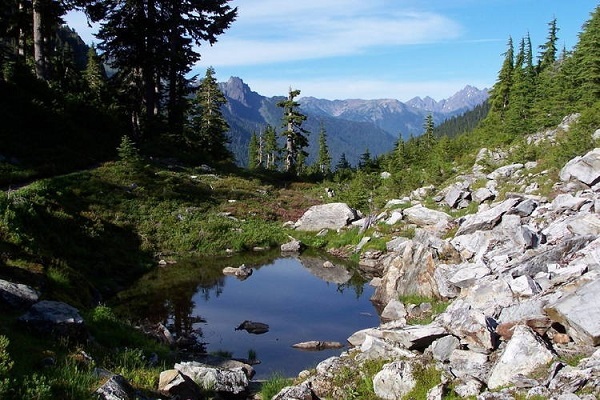 Olympic is a wilderness park, with much of its interior accessible only by trail. A variety of spur roads lead to various destinations around the park. Scenic drives to Hurricane Ridge, along the Pacific Coast and through the forested valleys of the Sol Duc, Hoh and Quinault Rivers provide glimpses of Olympic’s diversity. In 1885 the first systematic exploration of the interior of the Olympic Peninsula was made. Theat year Lt . Joseph P.O.’Neil led the first documentated expedition into the interior. In 1889 – 90, the Press expedition led by James Christie made a north – south crossing in five and one half months. In 1890 Lt. O’Neil returned and made an east – west crossing. Slowly a movement got underway to set aside some of the peninsula as a national park. In 1897 President Grover Cleveland created the Olympic Forest Reserve, a portion of which President Theodore Roosevelt designated a national monument in 1909. In 1938, President Franklin D. Roosevelt signed legislation creating Olympic National Park and in 1988 nearly 99 percent of the park was designated as wilderness. Over 1,400 square miles lay within the boundaries. In 1988, 876,000 acres were set aside as a formal wilderness which is 95 percent of the park land. Often referred to as “three parks in one”, Olympic National Park encompasses three distinctly different ecosystems — rugged glacier capped mountains, over 60 miles of wild Pacific coast and magnificent stands of old-growth and temperate rain forest. These diverse ecosystems are still largely pristine in character — about 95% of the park is designated wilderness. Most visitors come to the park from July through September; December and January are the quietest months. The Olympic Mountains are not very high, Mount Olympus, the highest, is just under 8,000 feet, but they rise almost from the water’s edge and intercept moisture-rich air masses that move in from the Pacific. As this air is forced over the mountains, it cools and releases moisture in the form of rain or snow. At lower elevations rain nurtures the forests while at higher elevations snow adds to glacial masses that relentlessly carve the landscape. The mountains wring precipitation out of the air so effectively that areas on the northeast corner of the peninsula experience a rain shadow and get very little rain. The town of Sequim gets only 17 inches a year, while less than 30 miles away Mount Olympus receives some 200 inches falling mostly as snow. Physical Description – Up to 6 – 8 inches long, variable in color from yellow to drab green-brown, some with darker spots. Slugs have two tentacles on their head, which tapers to a long body and pointed tail. Range – the Olympic species of banana slug occupies forests from western Oregon north to southwestern Alaska. Other species of banana slugs are found in western California. Habitat – Damp lowland forests. Food – A variety of plant and animal foods are eaten: lichens, leaves (including those of poison oak), mushrooms, animal carcasses and droppings. Habits – One of the banana slug’s best-known attributes is its production of slime, or mucus. This slime is vital to the slug in several ways, by enabling it to slide easily over logs, leaves and whatever else lies in its path. Slug trails can often be found meandering along leaves or smooth rocks. In addition, a thick coating of slime helps protect the slug from dehydration. Concerns – Although banana slugs are usually found only in their native forest habitat, they are often blamed for the damage done to gardens. Most of this damage is caused by several varieties of introduced European slugs, recognizable by their darker color. Banana slugs remain vital members of the forest ecosystem. The Olympic National Park Visitor Center in Port Angeles is fully accessible, as is the Hoh Rain Forest Visitor Center. Other centers and ranger stations provide varying levels of accessibility. Wheelchair accessible restrooms are available at nine of the park’s 16 campgrounds. Several campgrounds also offer paved campsites and picnic tables with extensions to accommodate wheelchair-users. Several nature trails are paved and wheelchair accessible. Others are gravel, but fairly level and may be accessible with some assistance. Among the park lodging facilities, Sol Duc Hot Springs Resort has accessible hot spring pools and several accessible cabins. The main lodge building and one room are accessible at Lake Crescent Lodge. Kalaloch Lodge has one accessible cabin. When hiking along the beach, round the headlands only on the out-going tide to avoid being trapped by the incoming tide. Use overland trails where they exist. Boulder Creek from the gate at the trailhead to the Boulder Creek camping area is open to the use of bicycles. Spruce Railroad Trail along Lake Crescent is a designated bike trail. There are 17 campgrounds in Olympic National Park. They are on a first-come first-served basis. Summers are most popular, and more crowded, as weather is warmer and drier. Plan to arrive early to obtain space, especially on weekends. Entrance fees (good for seven days) are collected at Elwha, Heart O’ the Hills/Hurricane Ridge, Hoh, Sol Duc, and Staircase entrance stations from May through September or later. The fee program at Olympic has recently changed in accordance with the Congressionally authorized Recreation Fee Demonstration Program. There are nightly fees (ranging from $8.00 to $12.00) for most park campgrounds. State fishing licenses are not required for stream and lake fishing, except that a Washington State special punchcard is necessary when fishing for steelhead and salmon. A license is required to fish in the ocean. Food and supplies are widely available in towns and cities around the park. In addition, concession-operated grocery and camper supply stores are located at the Fairholm General Store, Log Cabin Resort, Sol Duc Hot Springs Resort and Kalaloch Lodge. There are nearly 600 miles of trails traverse the park, ranging from short, easy loop trails to rigorous and primitive trails along high passes or rugged ocean beaches. A list of stables and outfitters can be obtained at visitor centers or by writing the superintendent. Check for restrictions or closures to stock in certain sections of the wilderness. Pets are permitted on a leash (up to a 6 feet in length) in park campgrounds and parking areas. Pets are prohibited in all park buildings, in the backcountry, and generally all park trails. Olympic has a moderate marine climate with pleasant summers and mild, wet winters. Summers are generally fair and warm, with high temperatures usually between 65 and 75 F. Summer is the driest season, with heavier precipitation during the rest of the year. Winters are mild, with temperatures at lower elevations in the 30’s and 40’s. At higher elevations, snowfall is generally heavy, with accumulations of up to 10 feet common. Closer to sea level, much of the precipitation comes as rain, with some infrequent snow fall. At any time of year, visitors should come prepared for a variety of conditions. Rain gear and layered clothing are a must.